Shame is ubiquitous, nevertheless, it's the elephant in the room and the underlying cause of many clients' complaints, including depression, marital discord, addiction, eating disorders, codependency, and low self-esteem. As clinicians, we're not immune from it either. We carry our own shame and pick it up unconsciously from our clients. Shame has many faces; among them are self-hatred, contempt, aggression, loneliness, depression, and emptiness. It clandestinely fuels arrogance equally with pride's opposite, self-doubt and insecurity. At bottom, we feel unlovable—unworthy of connection with others. Commonly, it shows up as fear and "shame anxiety" about being judged, rejected, or abandoned. Shame differs from guilt in that we feel we are the problem. Although guilt can spill over into shame, with healthy guilt, we believe we're redeemable, because we can correct our behavior and make amends; with shame, we feel helpless and irredeemable, because we cannot escape our own self-condemnation. Addicts and codependents have internalized shame from intense or subtle, but frequent, childhood experiences that were emotionally abandoning. The same is true for shamed needs and feelings. As adults, we can feel shame about them or even deny them so we no longer experience them. Internalized shame can endure unconsciously and erode confidence, self-esteem, and relationships. It intensifies and prolongs normal shame and no longer requires an external shaming event, but can easily be stirred up by self-judgment. From the very first session shame is in the room. Many people have shame about seeking professional help, often because they haven't been able to solve their problems on their own and consider themselves weak or self-indulgent for receiving help. They may be ashamed that they have the problem, such as depression, a failing marriage, or a sexual issue, and are especially ashamed talking about it. The clinician may be the first person they've told. Many clients have internal dictates that they shouldn't reveal their "dirty laundry" or show emotion if they should cry. They may also feel shame for losing control or because they imagine we're judging them. These beliefs are exacerbated by the power imbalance inherent in psychotherapy that puts clients in a one-down position. It can evoke shame if they've been in relationships where others wielded power over them. Initially, they may be ashamed of being ignorant of our protocol and worried they'll embarrass themselves. Professional boundaries and saying "no" to a client can also be experienced as shaming. Later in treatment, clients can become discouraged with their lack of progress, often blame themselves, and feel inadequate as a result. The less experience clinicians have, the more anxious they may become when seeing a new patient, often questioning their ability to meet the client's needs. This is particularly true if the clinician has not treated a similar case, or if a prospective client has a status or accomplishment idealized or envied by the clinician or announces that the session is a preliminary interview. It's for more than financial reasons that we want "to make a good impression." It's for our self-esteem. Shame and codependency go hand in hand. Social work both feeds and triggers codependency and underlying shame-based fears of being judged or rejected. To the extent clinicians have unresolved issues of shame, their self-esteem and worthiness may be on the line. Their shame can be stimulated with difficult clients or whenever clients feel inadequate, especially if they complain about lack of progress. This awareness can empower social workers to explore the client's feelings, once they realize it's not just they who are feeling inadequate. Armed with this information, clinicians can examine the client's shame, rather than become defensive or take an inferior position. When an apology is necessary, jumping in with one isn't therapeutic. It's far better to first uncover the client's projected feelings of shame. Similarly when clinicians make mistakes, shame can induce them to quickly apologize, thereby missing an opportunity to explore their clients' reaction. 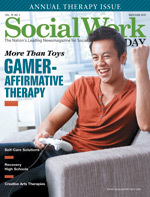 If a social worker needs the approval of a client, they may not maintain boundaries or confront clients when necessary. Or, they may want to be nice or giving, but is that therapeutic? Similarly, clinicians can be lulled into a complicit alliance of mutual pleasing and not challenge accommodating behavior. Therapy stagnates when clinicians don't address acting-out, manipulative, or compliant behavior. Whenever it's necessary to set a boundary, clinicians may face a codependent dilemma. Clinicians can feel anxious when they set limits or resentful if they don't. Shame may also be aroused in both clients and clinicians when social workers decline requests from the clients or refuse to answer personal questions. Clinicians may become anxious when it's necessary to discuss clients' devaluing, acting-out, or abusive behavior or to enforce policies about fees and cancellations. Fear that they will be subjected to clients' objections and anger or rupture the relationship can inhibit their effectiveness. Fears are based upon shame and hidden needs for connection and acceptance. However, clinicians are role models when boundaries are maintained. The intimate nature of psychotherapy can also elicit shame. Rather than being open, relaxed, and present, clinicians can become detached, rigid, and intellectual, or hide behind their authoritative role. Playfulness enables both the clinician and client to be spontaneous, to imagine, to free associate, and to connect. Fears may especially be activated when clients seek closeness the clinician is uncomfortable giving. Additionally, clinicians may feel obligated to comply or match a client's positive feelings due to underlying fears of abandonment. Clients rarely admit to shame—often due to shame—but identifying it is therapeutic. Shame is clothed in concerns about being liked or loved, what others think, defensiveness or sensitivity to criticism, people-pleasing, lack of assertiveness, depression, and indecision and procrastination caused by self-doubt and self-judgment. Clinicians can help clients trace their shame anxiety to its roots. Some clients act-out in self-destructive ways in order to avow shame and make it conscious. Others push themselves or have exceedingly high or perfectionistic expectations. Shame plagues them in the form of internal demands they "should" attain but don't. Negative self-comparisons to others are also a sign of low self-esteem and shame. Idealization and envy may suggest that a client feels inferior to someone else—including us. When clients aren't people-pleasing or attacking themselves, they commonly defend against shame thorugh withdrawal or rage, projection, blame, contempt, and arrogance. Self-pity may be an outward manifestation of self-judgment. When clients judge us, it's also a clue that they're doing the same thing to themselves. Similarly, when they blame or project unwanted material onto others, the defense of projective identification may distance them from their own shame-ridden reality. Humor can effectively deflect shame, but it may also become a dysfunctional personality style to cope with toxic shame. These defenses, first modeled by our parents, escalate arguments, which are made worse because we only take in love we believe we deserve. We feel unloved and hear negative remarks if we feel unlovable. In relationships, when one partner feels judged, rejected, or unimportant, he or she defends, attacks, or withdraws and is responded to defensively, setting off a mounting ping-pong match of defenses. They're fencers parrying phantoms who shamed them long ago. Clients' symptoms continue when clinicians don't address the primary cause, but by zeroing in on the shame that's driving them, clinicians can build clients' self-awareness, challenge their beliefs, and intervene to heal their shame. Clinicians can also track shame to its childhood roots and treat the underlying traumatic events. Ultimately, healing personal shame is required to contain clients' pain, emptiness, and hopelessness. — Darlene Lancer, LMFT, JD, is a licensed marriage and family therapist in Santa Monica, CA, and author of Conquering Shame and Codependency: 8 Steps to Freeing the True You.